"I love warm meals during cold months. 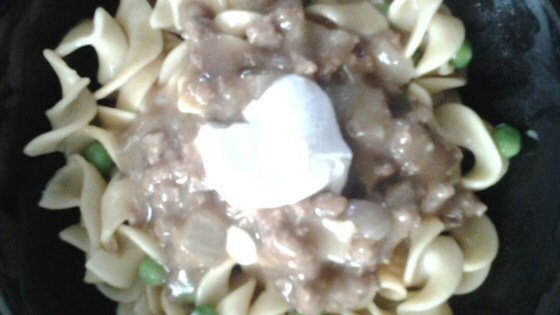 This ground beef stroganoff is one of our family favorites. Add a dollop of sour cream and enjoy." Dissolve bouillon in the boiling water in a large bowl; pour a portion of the broth into another pot for boiling the noodles. Bring the broth in the pot to a boil and add onion powder, dried onion, and garlic powder. Add egg noodles; bring back to a boil. Cook until tender yet firm to the bite, about 12 minutes. Drain. Stir in frozen peas and cover. Melt butter in a saucepan over medium-high heat. Saute onions until translucent, about 5 minutes. Add ground beef; cook and stir until no longer pink, 5 to 7 minutes. Add remaining onion powder and pepper. Stir in flour and mix well, 2 to 3 minutes. Add the reserved broth. Bring to a boil. Cook, stirring to avoid clumps, until beef sauce is thickened, 5 to 7 minutes. Serve meat sauce over a plate of noodles. You can use any frozen mixed vegetables in place of the peas.